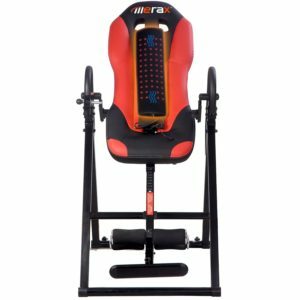 Merax Vibration Massage & Heat Comfort Inversion Table is a special hot new release, with ultra thick high-density padding and back support, and vibration massage and heat. Inversion tables are known to be good for releasing nerve compression, vertebrae pressure, elongating the spine, letting spinal fluids circulate properly and relaxing muscles. And they are used mainly by those that suffer from neck, hip, and back pain and want treatment or pain relief and stress relief without using medications. You’ll experience enhanced shock absorption and strength on your knee, ankle and hip ligaments and it will also help reduce the effects of aging. Vibration massage function is not just a simple- not so useful added feature but actually proper massage by the latest technology and the massager is removable if you prefer the inversion without it but it will certainly improve the benefit you’re getting from the table in terms of both pain and stress relief, which you may try and see for yourself. You will feel safe when you’re inverting as you will be in total control of everything with the pivot arm and your ankles will be nicely secured with the very large foam rollers that are also adjustable. 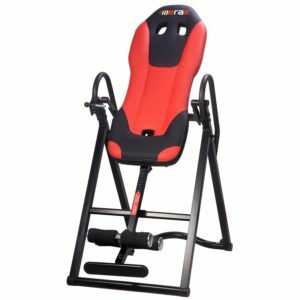 Merax Inversion Table is a sturdy and durable device of a steel tubular frame construction. The whole unit weighs 63 pounds and measures 59 x 26 x 47 inches, and it is a heavy duty inversion equipment that can have as much as 300 pounds of user weight but with a folding design and transport wheels underneath to be easily relocated and stored. You will be stretching at a maximum level with the inverting grips, and in a controllable and comfy movement you’ll be suspending your body upside down and enhance your posture and flexibility. It includes a deluxe dual pin system that makes it all very easy to adjust and find the right position for you and anyone as short as 4’10” and as tall as 6’3” can comfortably use it. If you haven’t been on one of these inversion tables before, it is not as scary as it looks- is very easy and safe to operate after you put your body against the backrest and lock your feet into the ankle rollers. You just start placing your arms over your head and as you move your arms up, the table will move back till you’re totally upside down, by using gravity and your own energy. Price is reasonable for what it offers and the assembly and operation are very easy. The only thing we can see as not so great is that the instructions could be clearer, but otherwise this is a very solid and comfortable inversion unit with massager and heat offering extra relief from pain and stress and relaxation. Highly recommended!